Syst & Deploy Microsoft MVP What does it take to become a Microsoft MVP ? 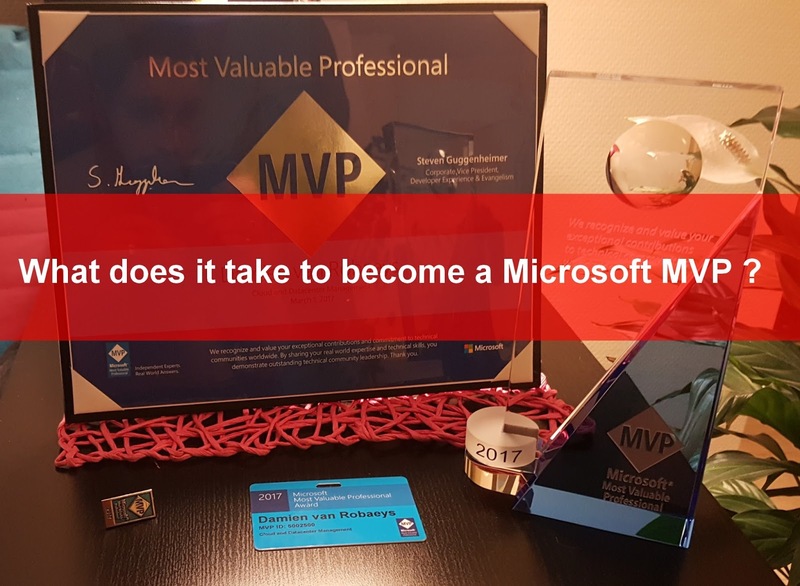 What does it take to become a Microsoft MVP ? In this post, no matter to talk about PowerShell, GUI or MDT but a will to share my point of view and experiences about the MVP Award. Internet is a wide world in which you can find almost whatever you want. You can easily upgrade your skills and learn new things, specifically in the IT domain. That's why the knowledge sharing is important to me. Last March I received a mail informing me I'm a Microsoft MVP... Waouh!!! I was so happy and honored and still am. In this post, I will try to answer all those questions. Firstly, an MVP is a community leader who likes to share his knowledge with others. I think this is the main part to become MVP. Are MVP better than others ? There are many excellent professionals that are not MVP's even if they deserved it, but I'm sure this day is coming soon for them. For instance I can mention Prateek Singh, Zeng Yinghua, Simon Dettling, Tzoyvaras Kostas, Daniel Ratliff, Dan Franciscus, Jérôme Bezet-Torres and many others, sorry those I forgot. I will say MVP's are not better than others but they are people with good ideas to share. In my case, I'm not a PowerShell expert, my scripts aren't perfectly written, but I have a lot of ideas and PowerShell helps me to realize them. The MVP award must not be the goal of the knowledge sharing it's more an accomplishment. You can be the best in your domain but I will say that if you don't share your knowledge, it will die with you, what a waste !!! Remember the day that you were looking for a solution to resolve an issue since many hours. You started to be crazy until you find "out" the solution from someone. For me if you're working on something interesting for you, it will necessarily interest someone else. I really like when someone tests my work, and gives me some feedback such as you should add this or this, even if it doesn't work, you can learn from others and others can learn from you. How to become MVP ? This part can be a bit obscure for some people. I will explain my own case how I became MVP. Four years ago, I started my blog, first I did some post in French but chose to proceed in English. First I posted some articles. While doing it I had more and more ideas to share, so I did more and more posts. My goal wasn't of course to share to become MVP, but I like to share. How many posts are required ? I don't know how many posts are required but I know the MVP team analyzes your work over the past year. Concerning my posts, I used to post about one or two posts a month, sometimes more. How Microsoft can detect me ? You are blogger or speaker and write for some months or years but nothing happened. As far as I know, there are two ways to integrate the MVP awarding process. First you can nominate yourself, using the following link. The second way is to be recommended by another MVP (Special thanks to Octavio Rodriguez). In this case, you will receive a mail that informs you, that you have been recommended from someone to become MVP. You will have to click on the link included in the mail and add informations about you and your contributions. Then the MVP lead of your country gets in touch with you. It can take a while, so do not lost hope. MVP lead contacting you does not mean that you are MVP or you will become one. In fact, it means that your profile will be analyzed by the MVP award team. See below an overview of my profile contributions to get an idea of the way to manage it. What is this MVP award team ? The MVP team is composed of some employees from Microsoft located in Redmond and also of some Community Program Managers spread out through different countries, see more about them in this link. How this team will analyze my profile ? Then they will choose whether you deserve to become MVP or not. When this team analyze profiles ? Three months ago, Microsoft changed his MVP award process. Now there are new MVP on the first of each month. So, if you were not awarded, on first of current month, do not lost hope and keep working, your profile will be analyzed subsequently and, if its deserves award, you'll get it on first of next month! How do I know that I will become ? How do I know that I am awarded ? You will receive Microsoft mail informing you, you are now MVP! What are the MVP benefits ? The MVP award allows you multiple benefits such as software licenses, Office 365 ... 3rd Party offers. You will be also invited to technical meeting via Skype, and to in-person meetings with others MVP and Microsoft employees. One of the benefits is the MVP Global Summit. It's a summit dedicated to all MVP's in the world and located in Seattle. For me it's a nice way to travel, to meet people for many countries, to learn a lot of thing and meet Microsoft employees. Becoming MVP doesn't mean that you will work for Microsoft, nor be paid for it. What it personally takes ? In my case, it's first a reward for the work I did and knowledge I shared. Then it also allows me to get more job offers, and more proposition from editors. Someone told me that when you become MVP, you are now forced to post more and more and more in order to be renewed the next year. Humm I don't agree with this point of view. Indeed, I have now more ideas to share, or also some new project ideas but my first goal is still to share my ideas. I will say that it will give you some new perspectives. For instance, if you only write posts, the fact to have been rewarded for your work can give you the motivation to do more for others.